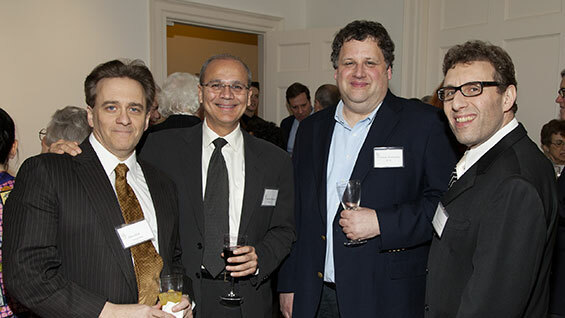 It may have been a wintry evening, but on March 7th guests arrived in a festive mood to celebrate and inaugurate The Cooper Union’s most important donors into its Lifetime Giving Societies. Guests arrived at the Stuyvesant Fish House for dinner and an awards ceremony hosted by Cooper trustee and alumnus, Mike Borkowsky (ME'61). Mr. Borkowsky, who is himself a member of The Sarah Bedell Cooper Society, opened the evening by saying that "Cooper established the Lifetime Giving Societies to recognize our most generous benefactors. Tonight we honor your philanthropy, which has helped sustain The Cooper Union for so many years." 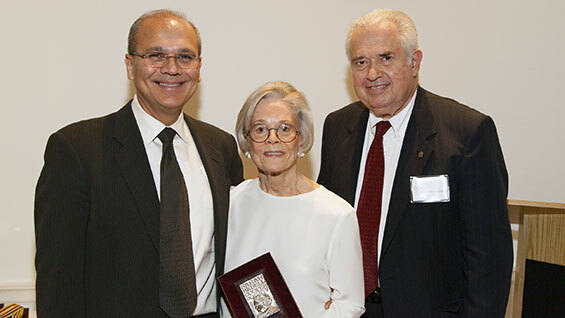 The highest award, The Peter Cooper Heritage Society award, recognizing individuals and families who have donated $1 million or more to The Cooper Union, went to Isaac Heller (Eng'52) and his wife Helaine. Isaac founded Remco toys while still a student during the late 1940s and later went on build a successful commercial real estate firm. 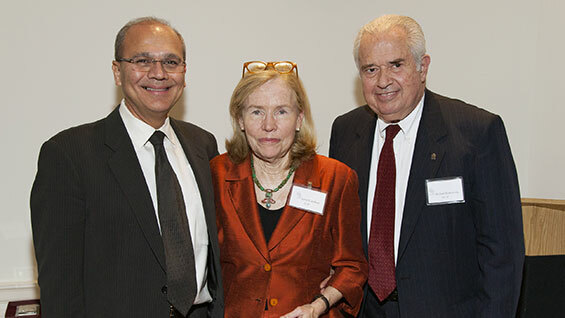 Just one week before the ceremony, Isaac and Helaine were to be inducted into the Abram S. Hewitt Society for donors of over $250,000, but they then made an extraordinary $1 million gift to The Cooper Union. 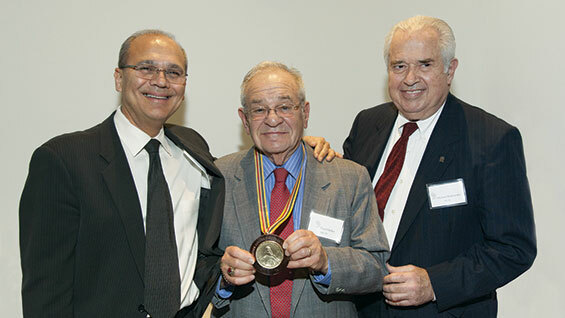 Paul Heller (ME'53), Isaac’s brother, and himself a member of The Sarah Amelia Hewitt Society, accepted the award on behalf of his brother and sister-in-law. Paul recalled his and his brother’s days at Cooper when professors would comment that "the Heller boys were at Cooper day and night" because Isaac attended the night school, while working during the day, and Paul attended the day school while working at night. Several people were inducted into The Sarah Amelia Hewitt Society for donors who have contributed at least $100,000. 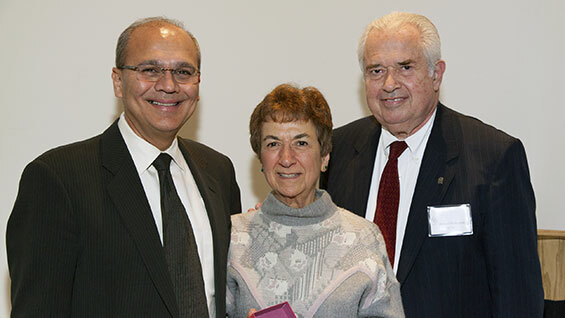 They included Jeremy Wertheimer (EE'82), one of Cooper’s newest trustees, and his wife Joyce. Jeremy founded and served as the CEO of ITA Software, a software company that powers airfare searches on the websites of many air carrier and other companies. Google acquired ITA Software in 2011 and Jeremy is now Vice President for Travel at Google. Janet Paxton Gardner, a graduate of the School of Art, was also inducted into The Sarah Amelia Hewitt Society. Janet serves on the Alumni Council and is the creator of the documentary "Mechanic to Millionaire: The Peter Cooper Story." This important film won a CINE Golden Eagle Award and has been broadcast on PBS stations nationwide, bringing the Peter Cooper story to so many. Ms. Gardner accepted her award on behalf of her parents, Edward and Elizabeth Gardner, explaining that her gift to Cooper was from a charitable foundation they had established. Her induction into The Sarah Amelia Hewitt Society was "a touching salute to [her] parents." The next inductee into The Sarah Amelia Hewitt Society was Alan Goldsmith (ChE'86/MChE'89). Alan’s Masters thesis, in spite of being 25 years old, continues to be used by his former advisor, Professor Irving Brazinsky, as an example of excellent technical writing. Besides faithfully supporting the Annual Fund for over 20 years, Alan has contributed to the Teaching Technology Initiative, which supports equipment upgrades in Cooper’s classrooms.